Bacchus Marsh, midway between Melbourne and Ballarat, flourished in the 1850s, after the discovery of gold, but grew more quickly once the rail link between Melbourne and Ballarat opened in the late 1880s. An ambitious irrigation scheme laid the basis for dairying, market gardening and orchards. Its most notable feature is an Avenue of Honour, 281 trees on the western highway approach, planted after World War I. Bypassed in 1972, the Avenue remains an elegant entry to the city centre. At the 2011 census the Bureau of Statistics deemed Bacchus Marsh to be part of the Melbourne Metropolitan area, but the region maintains enough agriculture to retain a level of rural distinctiveness, not quite subsumed by suburbia. Bacchus Marsh is a township 50 km north-west of Melbourne. To its east are Melton and the metropolitan urban fringe, and in the other directions there are rural townships. Bacchus Marsh is situated in a basin with the Blackwood and other ranges to the west, north and east. The junctions of Parwan Creek, Lerderderg River and Werribee River are immediately east of the town. It was named by Kenneth Clarke, manager for a Tasmanian land company which occupied a pastoral run north of Bacchus Marsh. He came to an arrangement with a neighbouring settler, Captain Bacchus, that neither would intrude on each other’s land, and referred to the area beyond his occupied land as Bacchus Marsh (1838). Despite the hilly approaches to Bacchus Marsh it became part of the route between Melbourne and the Ballarat gold diggings. Town reserves had been surveyed in 1839-40 to the north and south of Bacchus Marsh, on the banks of the Lerderderg River (Darley) and of the Werribee River (Maddingley). Both those places have been absorbed by the expansion of Bacchus Marsh. The actual site of Bacchus Marsh evolved through the clustering of buildings along the goldfields road. A government school was opened in 1851. Catholic and Anglican schools were also opened shortly afterwards, but closed in 1874 and 1864 respectively. Bacchus Marsh was not connected to the railway network until the late 1880s because of the steep terrain, and Ballarat was reached via Geelong. Consequently Bacchus Marsh’s agricultural industries were confined to local markets, despite the favourable soils and the seepage of water from higher slopes. The marshiness required draining in some places, as part of Bacchus Marsh is lower than the Werribee plains to the south. 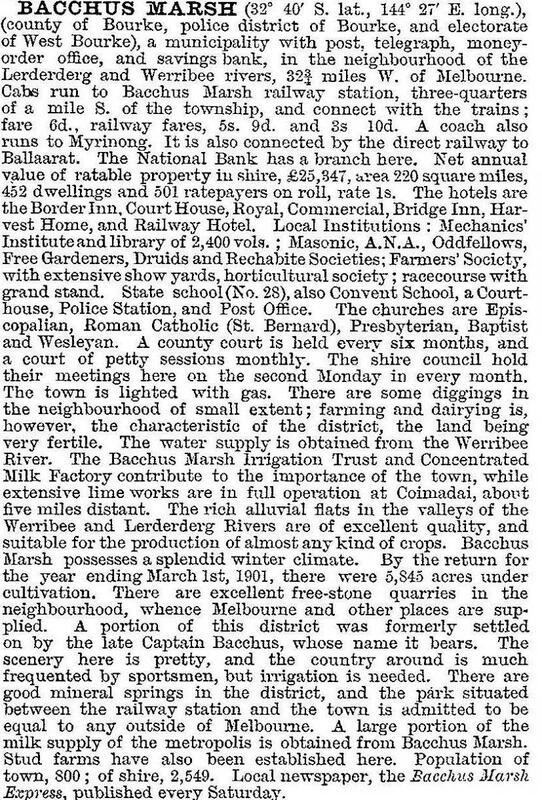 By the mid-1860s Bacchus Marsh had two flour mills (1853), a brewery, quarries, an agricultural society, a mechanics’ institute (1858) and Catholic, Anglican and Presbyterian churches. 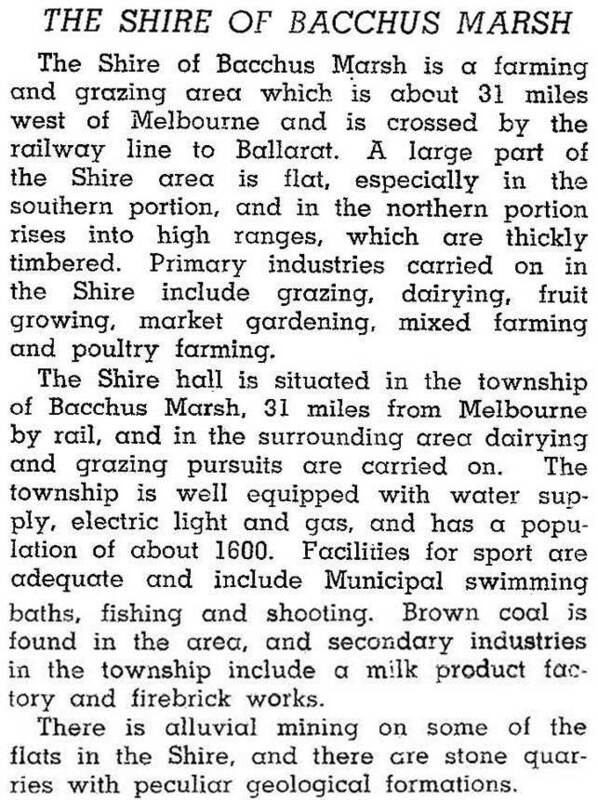 Bacchus Marsh shire was proclaimed on 23 January 1871. After World War I an Avenue of Honour was planted, consisting of 281 trees along the Western Highway. A high school was opened in Maddingley in 1922. Further facilities included a swimming pool (1938) and a war memorial hospital (1957). Irrigation was supplemented by the Merrimu reservoir (1969). Postwar industries included an artificial breeding cooperative (1959) and a hardboard mill (1961). In 1972 the highway, hemmed by the Avenue of Honour, was duplicated by the Western Freeway bypassing Bacchus Marsh to the north. The town’s population steadily grew during the 1970s, and expansion has quickened during subsequent decades. During the 1970s market gardening expanded, orchards decreased only marginally, and urban expansion has not caused orchards to quit the valley but to relocate to within reach of irrigation. Bacchus Marsh has expanded northwards to Darley and southwards to Maddingley where the railway station is located. The Maddingley Park, the railway excursionists’ picnic spot, is beside the station. There are two golf courses, several reserves with ovals, State (780 pupils, 2014) and Catholic (1890) primary schools, three secondary college campuses, including the Bacchus Marsh college (1921) (810 pupils, 2014) and grammar school (1988), and an aerodrome. There is also a hospital, a showground and a racecourse. The Maddingley brown coal open-cut mine (1932) is two kilometres south of the railway station. There are several registered buildings, including Captain Bacchus’ Manor house (1847), the Express newspaper office (1866), the court house (1859) and a number of dwellings. The Manor is one of Victoria’s earliest surviving substantial homes. Approaching Bacchus Marsh from Melbourne, the Western Freeway crosses the steep Djerriwarrh Creek valley where there is an historic bridge (1859). The freeway rises to the equally steep Anthony’s Cutting and on to the old Western Highway and the beginning of the Avenue of Honour. A proposed bypass, Woolpack Road, was to be widened, but involved the removal of nine of the 281 Avenue trees. One of the trees honours Rupert Moon, VC. The Bacchus Marsh community was split over the loss of the trees, and the Avenue was heritage listed in July 2010. Until the bypass is built, the sole north-south route through Darley-Bacchus Marsh-Maddingley is the main street. An alternative bypass would encounter costly bridge and earthworks, as the terrain enters the steep Pentland Hills area west of Bacchus Marsh. In 2013 Victoria’s state planning minister released a planning blueprint that signaled population and employment growth in rural towns including Bacchus Marsh. In 2014 Bacchus Marsh was connected to the NBN (National Broadband Network). Farming in the shire occupied 45% of its area (565 square kilometres) on which 4200 cattle and 58,500 sheep and lambs were grazed in 1994. The apple crop in 1994 was 4.96 million kilograms. Much of the unfarmed land is in the Lerderderg Gorge state park, north of the town. The Bacchus Marsh township (including Darley and Maddingley) held about 90% of the shire’s population. On 6 May 1994 Bacchus Marsh Shire was united with Ballan and parts of Bungaree and Buninyong Shires to form Moorabool Shire. *Populations 1954-2001 include Darley and Maddingley.